This Discovery II brake kit (Part # 9542F) offers a perfect mixture of value and performance for those looking to replace the front and rear brake parts on their Discovery Series II 1999 – 2004 with new rotors and Ferodo brake pads. Our brake rebuild kit conveniently assembles the parts you need to replace and repair the brake components on your vehicle. The set includes two front brake rotors, two rear brake rotors, front and rear Ferodo brake pads, as well as all of the hardware, seals, pins and clips you will need for the rebuild. Ferodo pads are asbestos-free and offer excellent fade resistance, dry or wet, for improved stopping distance. They feature a special anti-squeal backing that virtually eliminates brake squeal. Atlantic British gives you options when it comes to brake repair. We carry a full range of parts including rotors, calipers, brake pads, brake bleeders and brake hose kits In addition, Atlantic British offers three other Discovery II brake rebuild kits to fit the price and purpose you are looking for. 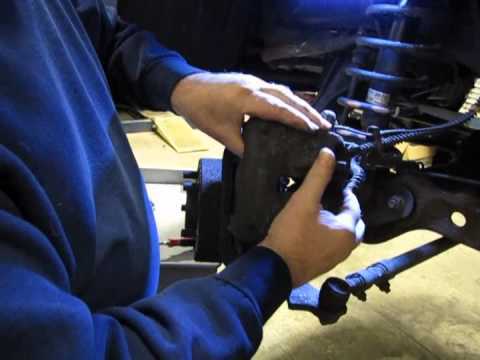 Atlantic British Ltd. Repair & Maintenance Academy How-To Video: How to remove and replace the brake calipers and brake pads on a Land Rover Discovery Series, II 1999 - 2004. Watch Jim as he demonstrates how to remove and replace the calipers and brake pads on a Discovery II. The same process with work for a Range Rover P38, 1995 - 2002. Questions about this video? Call us at 1-800-533-2210 or contact us via live chat.